A tip is a small amount of money given to a person to show appreciation for a service they have provided; on the IndieWeb, a site can have a tip page for others to show appreciation for it, and for individuals to have a simple URL to share for others to tip them, like for technical help provided without an explicit payment request. For an alternate definition of tip in the sense of a recommendation, please see that page. You can link to it from your home page so those that enjoy your posts can tip you. You can link to it from private email responses you give to folks asking for technical support. Create a simple tip page at /tip on your domain, and even better, allow a nested amount which prefills / preselects a tip amount, while perhaps providing alternatives. See pay for similar patterns. 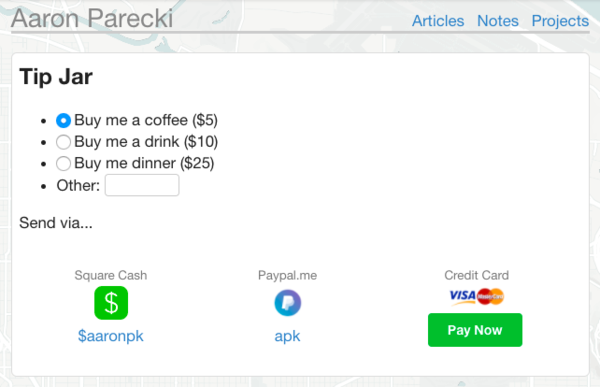 Aaron Parecki has had a "tip jar" on his website since 2017-03-08. The page has three suggested amounts (coffee, a drink, dinner), and a field to enter a custom amount. Choosing an amount then updates the Square, PayPal and credit card buttons to pre-fill that amount when clicked. 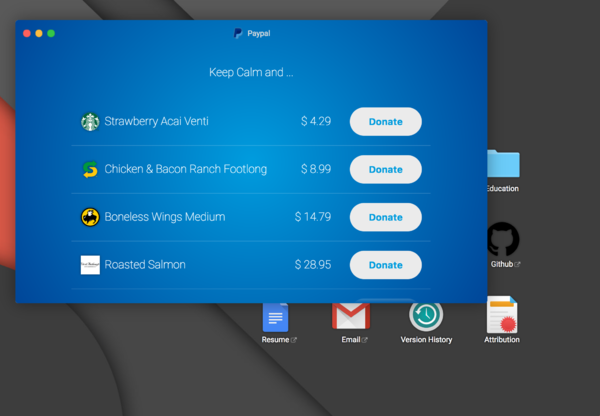 Clicking the PayPal icon on http://jasonpark.me opens a window where you can donate a few pre-selected amounts. The tip links are added on build time statically, with a message depending on the category of the post. For now, it's a pre-filled value of 3GBP, using either PayPal or Monzo (UK only). No JS included. Artur Paikin has a "thanks" page which links to several ways to "say thanks by sending me a little money"
As of 2018-02-01, Tantek Çelik has a "Tip" page linked from his home page (tantek.com) using a 👏 with a default of $1 already filled in, similar to his pay page. "Tip" seemed to make more sense in wording and in URL as a link from the home page. This page was last edited on 19 January 2019, at 14:15.